This a book that I read as a young man, a little to do with motorcycles, mostly about a "journey", but some think it is an interesting "read", I enjoyed it. 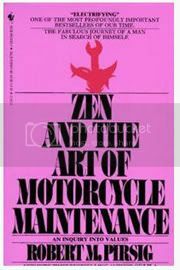 See what Wikipedia says about Zen and the Art of Motorcycle Maintenance: An Enquiry into Values. And, do your own google search for more information, as there is always more and sometimes opposing opinions. 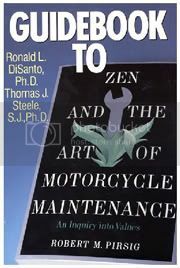 And, I see that there is now a Guidebook to Zen and the Art of Motorcycle Maintenance, maybe this will help in understanding the original book. If you have any Motorcycle Adventure Ride Books, DVD's or Magazines that you'd like to share, please see Sending Us Info on how to get your information to us.